The Irish Ambassador Paul Sherlock and Second Secretary, Robert Hull are pictured above with Tom O’Mahony and Brendan Lynch of DLRS and Wil Byrne of AG2. 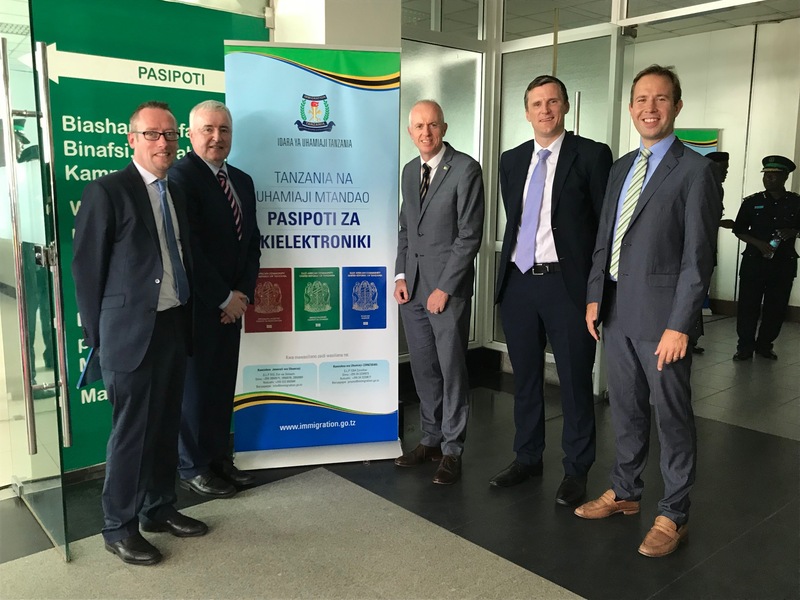 DLRS team members Tom O’Mahony and Brendan Lynch were guests at the launch of the new ePassport for Tanzania on Wednesday 31st of January. DLRS were responsible for book design and production with Wil Byrne as lead designer on the project. Both DLRS and Wil were part of the HID Global team that delivered a cutting edge eTravel solution that will provide smoother travel and improved border security for Tanzania. The new e-passport will make travel easier for the country’s citizens, such as simply scanning their passports electronically at border control stations upon entry and exit. The e-passport conforms to all international standards as set out by the International Civil Aviation Organisation, ensuring that its features can be used by Tanzanians as they travel around the world. A notable benefit is that an e-passport holder can be issued with an emergency passport on their smartphone if their passport is stolen or lost. This convenient solution is enabled using HID’s award-winning Seos technology for mobile citizen IDs, called HID goID.